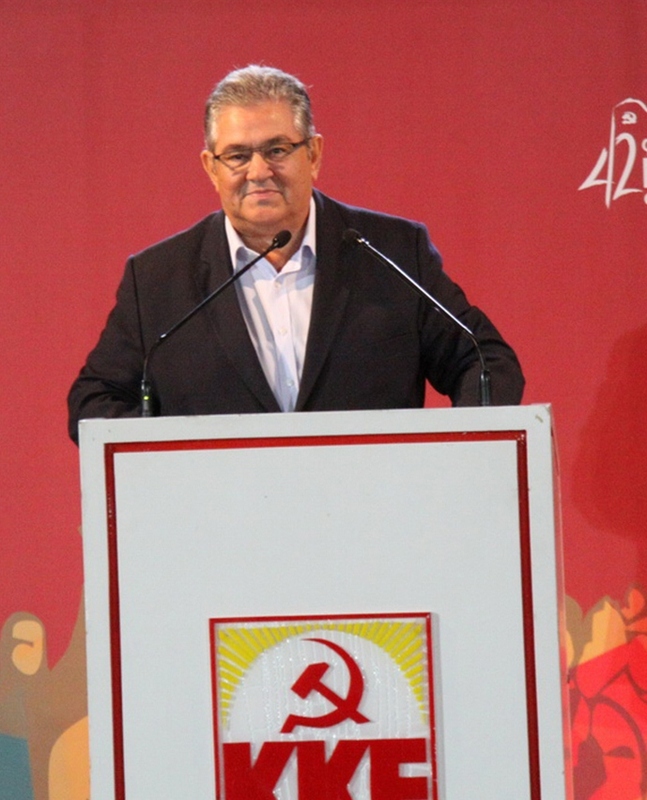 The full speech of the General Secretary of the CC of KKE Dimitris Koutsoumbas at the 42nd KNE-Odigitis Festival, Saturday 24 September. Source: inter.kke.gr. The festival of KNE-Odigitis every year leaves its mark. With hundreds of events all around Greece and naturally with the actvities here, in the “Antonis Tritsis” park. If some people are wondering why the festival of KNE endured when all similar initiatives of other political organizations have unraveled over time, the answer lies in the content of the festival. Every year, thousands of young people meet, are entertained and discuss their worries and their dreams. With the contribution of renowned artists from every field, by promoting amateur creativity, by getting to know the workers’- people’s culture and the artistic works of great communist and progressive creators that we have the responsibility to disseminate to the younger generations. At the same time, thousands of young men and women, pupils, students, young workers and unemployed youngsters come in contact with the history of KKE and the labour movement. They find about the activity of the previous generation of fighters, they are inspired, they make a decision to take their place in the organized struggles, they take up the baton for the great battles that we have in front of us, for the “earthquakes that are to come”. Even more so this year because of the celebrations that we have in front of us for the 100th anniversary of the KKE and the 50th anniversary of KNE, many young people come into contact- some of them for the first time- with the history of the Democratic Army of Greece, which this year celebrates the 70the anniversary of its founding. This is not some obsession of the KKE. The history of the KKE, the conclusions that we draw for the strategy of the party are weapons in the complex daily and demanding struggles against the system of exploitation. In the great cause of the fight for socialism- communism. The history of the struggles of our people is not something for the history museums nor just a general reference to a heroic past. The goal is for the party and KNE through the study of history to become more capable in the struggles, to learn from the important moments of the class struggle, as well as from the mistakes, from the upsurges and also from the difficult moments of the struggle. We must draw on new strength to vindicate and complete this great and militant history. The fact that the KKE studies its history with objective criteria, without prettifications is proof that the KKE is made of “different metal”. This way we confirm that the goal of our struggle goes very far, as do our hopes! The festival every year with its events all around Greece is the meeting of thousands of young people with the KKE and its positions, where they can get to know it first-hand and not through the words of those who fight against it. Here in the festival and through all the activities of the KKE and KNE, militant values and ideals are formed, in rupture with the values that are cultivated by the exploiters and their rotten system. Solidarity, comradeship, the desire for knowledge, the love and caring for the toiling people, the daring, the endurance in the difficulties, the militancy, the collectivity. These values stand against the notion “your death is my life” that is cultivated in the youth either in the places of education or the work places. And these values, these “virtues” are acquired and formed through the continuous struggle, through the attempt to help the people and the youth to stand up tall. 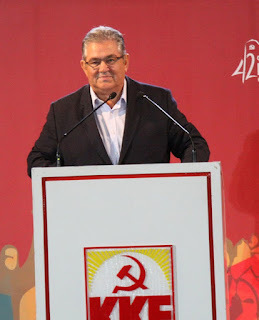 The festival of KNE is enhanced and it embraces even more aspects of the life of the youth, because its oxygen is the political proposition of the KKE, the positions of KNE. In the KKE and KNE every young man and woman coming from the working class and popular strata is able to find support and also the answers to questions that they have regarding the concerns and worries about their future. Especially in the youth, which they want cornered and disappointed, today we can show with even more arguments and proof that the people, the young men and women have not yet said their last word. They haven’t yet tested their great strength which lies in the intensification of the struggles, the strengthening of the people’s alliance against the common opponent, the monopolies and their power, as well as their supporters regardless of the masks that they wear. Now, the youth itself has more, direct experience. All kinds of governments have been tested. In practice, all the “so-called” easy solutions, as SYRIZA described them. This experience can become strength if it meets with the organized struggle, if it meets with the political proposition of the KKE for workers’- people’s power. The bourgeois class, its officials know very well that they have created a generation that lives in worse conditions than the generation of their parents. And this could be the spark that will lead to struggles. That is why they take measures so that it won’t be expressed in the decisive participation of the youth in the struggle, especially at the side of the KKE and KNE. That is why they cultivate the notion that “nothing changes”, when the truth is that much more is needed today in order to have results. That is why they cultivate false expectations, like they did before the elections with SYRIZA, which today are once again promoted with a different disguise by various forces that speak in the name of the “left”. At the same time they aim to win the tolerance of the youth towards the anti-people policies. Today’s government tries to do so with the same arguments as the previous governments. That’s why they utilize even the most ridiculous figures and personalities, even fraudsters, in order to channel the dissatisfaction and anger of the people in this direction. The bourgeois class does not hesitate to use even criminal fascist organizations, like Golden Dawn, cultivating racism and anti-communism, hatred for the victims of war, hatred for the labour movement. With the KKE we counter-attack! We must build obstacles to all new and old anti-people measures, we must demand the restoration of all losses. We must fight to satisfy the contemporary needs of the people and the youth. Because there is a different way, against the flexible life, against wandering from unemployment to miserable underpaid jobs which is the general situation for the youth in particular. Today, it is possible for the youth and the working people to live the way they deserve to in the 21st century. The possibilities for that exist. The enormous development of production and science can be used in favour of the people and their children, in order to secure their prosperity. The requirement for this to happen is for the working class to take into its hands the keys of the economy and power. To finally get rid of the rotten situation we are living in.This way we can ensure the programmed development of all sectors of the economy using as criteria not the profits of the few, like today, but the satisfaction of the social and popular needs. Here, in the direction of the overthrow of the system, there is an way out for the youth! SYRIZA and its government with ANEL, chose- as Mr. Tsipras recently said- to be in the front line. SYRIZA chose and was chosen to be in the front line of the implementation of the commitments of the memorandum, the orders of capital, the directions of the EU, the decisions of NATO. In a few words, SYRIZA was chosen to do the dirty work on behalf of the capital and the EU, because at least in this phase, it is able to deceive and manipulate people easier than the traditional bourgeois political forces. Because, first and foremost it is able to neutralize, to paralyze radicalism, to cultivate fatalism and defeatism amongst people that put their hopes and expectations in SYRIZA, and then were disappointed, disproved and now are still in confusion. Maybe the management of the capitalist crisis does not allow differentiations of the policies that the various governments implement, it might not allow in the field of the economy deviations from the accurate implementation of the anti-people measures and restructurings by every government, however at the level of slogans, propaganda, the promotion of policies, it has some room to maneuver. And in at this level, SYRIZA has more flexibility and finesse than the other bourgeois parties by using its opportunist physiognomy and the status of the “former communist” that even today some of its members use. Who else could have brought the third memorandum? Who else could have established NATO in the Aegean, using as a pretext the refugee flows, and beg for the founding of a new NATO base in Karpathos? Who else could advertise better the NATO base in Souda to the Americans as the most appropriate one for the operations in the area? Who else could have completely buried social security? Who else could have baptized privatizations as being “utilization for the public interest”? At the same time that SYRIZA denounces the EU for the austerity policies, in order to become popular to a more radical audience that questions this capitalist union, it spreads new illusions that the EU can be corrected if an alliance of the south is formed or if the correlation of forces is in favour of the so-called progressive forces in which they include the anti-people governments of Hollande, Renzi and others. Of course, when Tsipras and his European friends talk about putting an end to austerity they do not mean the restoration of wages, pensions and other rights, but mostly about state money for the monopolies to invest. At the same time they denounce the EU for inhumanity against the refugees, they continue to support the agreements between the EU and Turkey which they signed, which are the epitome of inhumanity caging thousands of desperate people in our country. At the same time that they denounce the oligarchy, the economic and political system that allegedly fights the government, they implement one by one the demands of the capital which they provide with benefits, tax exemptions, hot money for its investments. At the same time that they claim to be “deepening democracy” and plan to stage fiestas for the revision constitution, they plan to restrict trade union activity, the right to strike, even to legalize counter strikes, lockouts- a gift to the employers. At the same time that they guarantee to the capital for the recovery of its profitability, they sell to the people the fairytale of “just development”, “just distribution of the produced wealth”. And until then they tell the people to wait in the ranks of the unemployed, the soup kitchens, the lists of those who owe money to the tax office, the percentage of part-time employment, the unpaid jobs in the slavery regime that the prime-minister recently discovered. They tell the people to wait for crumbs of bread to fall from the table of capitalist profits. This flexibility of SYRIZA that the other bourgeois parties do not have is recognized by the capital as well as the cadres of the EU that congratulate the government on its skills, realism and fast adjustment. This flexibility however is very dangerous for the people because it cultivates a modern slavery dressed in a left wrapping, it cultivates reduced demands, compromise with crumbs. The course of SYRIZA, its transformation into a distinct social-democratic party was predestined. This is what happens to every party that accepts the capitalist way and promises that it can humanize it. Mr. Tsipras continues to give lessons of “leftness” and radicalism, always adapted to each specific audience. Sometimes he remembers that he chose to be in the front line because he is not simply a commentator on the developments, that he aims to change the social correlation of forces and other times he mocks those who “fantasize about an ideal society”. In other words, he says to the people each time the same thing: “Since the correlation of forces does not change easily and since the ideal society that the KKE envisions is not easily realized, you should adapt to today, to the system and not ask for much. This logic of necessary adaptation, as they call it, can immobilize forces that today should act, with a line of rupture and overthrow, for the correlation of forces to really change. It postpones in this way to the unknown future, any thought of overthrow of the capitalist barbarity. This is the essence and the historical role of opportunism. It always assisted the capitalist system in difficult moments for capital. The moment will come when all who were deceived in this way , will turn their backs on them and chase them away. Because SYRIZA was selected to be in the frontline to crush the workers, to manage the capitalist system. The KKE is opposed to them. It is in the frontline for the overthrow of the rotten capitalist system, for struggle for the new society, socialism-communism. The bourgeois groups that criticize the government either because of not being decisive enough in the application of the reforms or because they have more confidence in the more traditional parties, like New Democracy and PASOK, know it well. Certain media and well known defenders of the system even offer covert support to SYRIZA, supposedly criticizing it but in fact adding its propaganda. They even try to present it as an almost communist, pro- soviet party, implying that its "communist character" is to blame for anything bad that has emerged from their policies. They think that in this way they can blame socialism for the government's anti-people policies. They want socialism to be identified in the youth's consciousness with the property taxes, memorandums, anti-popular measures. They want the KKE to be blamed along with SYRIZA for the government’s deeds. They are certainly not naive. They know what kind of a party SYRIZA is and whom it serves, they are just being provident, as loyal servants of the capital that know well how to serve it. They are invoking the people's problems in Venezuela. But, of course, it was not socialism that went bankrupt in Venezuela, but the well-known narrative of opportunists like Tsipras-Lafazanis-Konstantopoulou, that they could allegedly tame the iron laws of the system in the framework of capitalism, that they could prevent capitalist crises, that the profits of the few and the needs of the many could be reconciled. Of course SYRIZA doesn't mind this criticism, as it presents SYRIZA as something different to what it really is, a bourgeois party that serves capital's power. And this is exactly what the quarrel with New Democracy is about: who is going to lead the implementation of the third memorandum., support the capitalist recovery and manipulate the people at the same time. New Democracy on the other hand is nervous seeing how the Greek and international centers support the government of SYRIZA – ANEL and is trying to propagate its own “willingness”, as the most “genuine child” of capital, to implement the entirety of the restructuring measures that it requests. It promotes its own anti-popular plan which includes fewer taxes for the capital and less public spending for the already reduced public services for the people's needs. It takes advantage of SYRIZA's anti- popular policies to declare it innocent of what it had done during its own period of governance. It presents capital's needs, the cynicism of the anti - popular measures as the “objective truth”. Hence the true difference between SYRIZA and ND can be depicted in the quote “You can choose which of your pockets we'll take the money from”!! The left or the right pocket.Because it is clear that the third memorandum, the overthrow of the working people's rights and the support for the capital's profitability and recovery, are in both parties' programs. Along with these, PASOK and “The River”(Potami) are trying to reconstruct – without great success so far – the bankrupted centre – left, especially now that they see that SYRIZA has taken the place of the old PASOK and is becoming the favored child of European social – democracy. The Center Union , that used to be considered absurd, is now playing the role of the outrider that is willing to support the system and every anti – popular governmental formation it may need. The made -in -Greece nazi-criminals continue to serve as the system's watchdogs, pouring their racist poison and playing a leading role in vulgar anti-communism. They do whatever they can for their leaders to increase their wealth and of course their various suspicious connections with international centers and services and shadowy networks. In parliament Golden Dawn also pretends to be an anti-systemic force, while at the same time it is asking for more privileges and tax exemptions for certain sections of capital, and outside the parliament it continues providing the employers with cheap workers, functioning as slave traders. From the podium of the 42ND Festival of KNE – Odigitis we want to address those who see that this situation can't go on, those that are willing to come into conflict with fatalism and meager demands. We say to them : the only party that can express you is the KKE, even if you have reservations on certain issues with it. We especially address the people that still feel themselves to be leftwing, that may have voted for SYRIZA or other leftist forces and now are indignant. We call for them to take the step today, to join forces with KKE. The situation cannot change through disillusionment or finding excuses for this government. We should march together, now. To revive hope and optimism again in the struggles, in the movement. We call on you to meet with us, discuss and at the same time fight within the movement for the KKE'S proposal for the way out. Because this is the only answer to the capitalist barbarity we live in. Because it shows the development that will satisfy the entirety of the people's needs. This proposal is realistic because there are all the objective preconditions for it. The goal is to change the correlation of forces in favor of the working class and the popular strata, for the power to finally change hands. For the working class and the people to take the keys of the economy, the ownership of the means of production into their own hands. For the country to be disengaged from the imperialist unions, while developing economic relations of equality with other states. For the people to be able to live according to their contemporary needs, according to the potential provided by science and technology, the productivity of labor, the great natural wealth resources and the potential of our country. Our 19th Congress provided our party with a new program, an elaborated strategy for socialism. It is a program that actually gives answers and directions for our party's leading activity as an “all – weather” party, under any circumstances and difficulties. Today we are more capable, armed with our party's program, the conclusions of the study of our party's history, the experience drawn from socialist construction, to shed light on the duties our party has in the years to come. Staying away from any complacency, self – satisfaction and carelessness, but with the experience we have from the realization of the decisions of the 19th Congress, we can set our next tasks for our party in view of the 20th Congress. Marching towards the 20th Congress, we set a goal for an all-round reinforcement of the KKE, to meet the needs for the immediate regroupment of the labor movement, the development of the social alliance in an anti-capitalist, anti-monopoly direction, for the struggle against the imperialist war, for working class power. We want to assess the work we have done for the assimilation of the party's program, the difficulties we have faced and are still facing. This assimilation doesn't only have to do with the agreement on the character of the revolution and the power we aim for, but also with the deep understanding of the economic and political direction, the objective and subjective preconditions on which the escalation of the struggle for worker's power will depend. It also has to do with the conclusions drawn from the study of the Party's history up to now as well as the history of the international communist movement. This study has proven that the main problem so far has been the lack of a correct strategy, the lack of readiness of the Communist Parties in terms of program and organization, to lead the people’s revolt in revolutionary conditions to overthrow capitalist power. This study of historical experience has proven that the “reform strategy” took over, the strategy of penetrating the bourgeois capitalist power through the very organs of bourgeois power, in collaboration with parts of the bourgeois class. And while the Communist Parties had socialism – communism as a goal in their program, they actually always put an intermediate intermediate stage before it for the maturation of the revolutionary forces. This strategy resulted in some Communist Parties not meeting their duty, when the conditions of a generalized economic crisis were expressed in their countries that led to a generalized imperialist war and after that a revolutionary situation. To struggle consistently based on our program, which is the aim of the concentration, maturation and organization of the working class as the leading social force of the revolutionary process, means that this struggle should take place, with this objective, within the working class and the other popular strata even in non- revolutionary circumstances. The party fights for that objective independently and without giving in to the various means of pressure used by opportunist and bourgeois forces, not even to pressure applied by the working and popular masses, asking for immediate solutions within the system, to problems that the system itself creates. This means that we shouldn't follow the logic of detaching the everyday political struggle concerning various burning issues – the crisis, the war, a coup, intensification of state's violence and suppression, Nazism-fascism – from the main revolutionary struggle itself. In the years that have passed since the 19th Congress we have set some crucial issues concerning the advancement of our strategy, the preparation of the movement, issues that we have highlighted in everyday struggle within the movement as well as in our political action through the successive election battles we went through these years. For example we insist on showing that the EU is a union of capitalist states that cannot be improved or humanized, nor can capitalism. The struggle for radical changes at the level of the economy and power that will lead to disengagement from the EU and NATO is to the benefit of the working class, the people and not sections of capital that seek the exit of Greece from the EU and the Eurozone, or even its attachment to other allies like BRICS, for their own interests. We insist on highlighting the fact that every government that works in the framework of capital's power will be its organ, no matter what its name. That's why our Party will be present in the government of the people's power that will serve the satisfaction of the worker's and popular needs, and not the profits of the monopolies. We insist on showing that the bourgeois democracy is a democracy for the minority, actually a dictatorship of capital. We insist on highlighting the fact that fascism – nazism is an integral part of the system and that it is properly confronted through the struggle against the exploitative system. We insist on pointing to the danger of generalization of an imperialist war in our region, with the participation of Greece, which will actually be the participation of the Greek bourgeois class claiming their share in the division of the wealth that is currently taking place. Today more than ever we see the relevance of the slogan “the people, and especially the youth shouldn't shed their blood for the interests of capital, the interests of the exploiters”. Today, marching towards the 100th anniversary of our honored and heroic Party, we can be more capable in the promotion of our political proposal that corresponds to the potential for the working people to live better, based on their contemporary needs, as long as the productive potential, the wealth resources of our country, the concentrated means of production become social property, with central planning, active participation of the working people in the organization and management of social production and social services. This power, based on the people that will be decisive and organized, will be able to exploit the contradictions between the capitalist countries, to come to beneficial agreements. And above all, it will be able to encourage other peoples and movements to follow the same route. Besides, history has shown that when people march forward and struggles for power, there are certainly going to be other peoples that will not only show their solidarity, but follow the example. We can be more effective in order to be at the front of the daily struggles of the workers, to contribute to the regroupment of the labour-people’s movement, the promotion of the Peoples’ Alliance. We can be more effective as a Party in order to respond to the complex and difficult duty to renew and extend our forces, mainly amongst the productive age groups and above all amongst industrial workers, amongst workers in large workplaces, amongst young workers and the unemployed, amongst the children of the popular families. We can be more effective as a Party to guide KNE into entering a phase of a significant development of its forces, to develop forces amongst the school students from working class and popular strata families, the pupils and students in technical-vocational education, the students from a working class or popular background. For KNE to be able to educate, to form young communists, effective members and cadres of the party, militants of the class struggle in various conditions. We can be more effective with the strength of the communist ideals and the dynamism of the class struggle for socialism, to inspire young artists and scientists who care about the workers’ and people’s needs, all those who resist individualism and the rottenness of capitalism, who have open minds, thinking and desire for the possibility of a superior type of organization of social production, of all the aspects of society. We can be more effective as a Party, in order to respond to the duty of regrouping the workers movement and reinforcing the Social Alliance, so that we can undertake the major responsibility we have towards the working class, the people. To respond also to the duty of the defense, the fight for workers-people’s rights, to the duty of the struggle for the overthrow of the capitalist society, for socialism. We can be more effective as a Party, to be leaders in the development of struggles for very various demands, without detaching this active from ideological work and struggle regarding the historic mission of the working class, the abolition of the exploitative social relations, the construction of socialist-communist relations and the connection of each economic and political struggle under any correlation of forces and phase of the class struggle with the duty of workers’ revolutionary power. We can be more effective as a Party in order to prove in a practical why a century of the KKE’s existence makes the KKE the “youngest party”. The KKE is the youngest party because precisely because of what it represents regarding the property relations, all social relations, the social organization as a whole ,which is the only progressive future for humanity in its entirety. We advance forwards with dynamism.